CHILE: Administrators of troubled UK-based developer Rame Energy are holding exclusive talks with an unnamed potential buyer for the company's assets in Chile. "The joint administrators have entered into an exclusivity period with a potential purchaser relating to the acquisition of the interests held in relation to group subsidiaries based in Chile," the company said in a release to the London Stock Exchange. "Detailed information has not yet been released, both as a function of contractual confidentiality and also in order to protect price-sensitive information," the Chile-focused firm said. Discussions continue over Rame's UK operations and assets. The announcement came just a month after Rame entered administration with outstanding debts of around £4.4 million (€5.25 million). Rame's financial difficulties started after a non-brokered private placement to raise £2.8 million to fund its 210MW portfolio of solar and wind projects failed. Rame blamed the setback on "difficult market conditions and the outcome of the UK referendum on exiting the European Union". Administrators have been talking to a number of potential investors, which could provide fresh capital to recapitalise the firm or acquire assets in Chile and the UK. "A number of proposals, varying in nature and quantum, have been received, which have been carefully considered," Rame said. "In the meantime, the joint administrators continue to liaise with the directors of the Chilean subsidiaries and are assessing the availability of working capital to enable those companies to continue to operate as going concerns," it added. Rame owns the 1.8MW Cerro Coihue site in southern Chile, which was launched last March and supplies electricity to the Cerro Bayo gold mine, owned by Mandalay Resources. 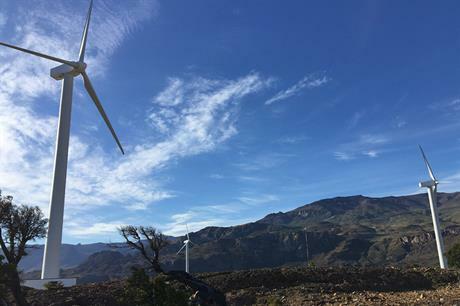 Earlier this year, it sold its 20% stake in the 15MW Raki/Huajache wind projects in southern Chile to Cayman Islands-based InterEnergy Holdings for around $4.4 million (€3.9 million).